I mentioned in a recent post that the diffusion of St Oswald’s legend on the continent owed something to the development of an Oswaldian bridal quest that featured a raven. When you look at late medieval and renaissance artwork, church murals, and some stained glass windows featuring Oswald, you often see a raven (sometimes holding a ring in its beak) somewhere around him. The ultimate origins of the raven are not hard to fathom but how the two distinct branches of raven/bird stories developed are a bit of a mystery. Oswald was born to a pagan king named Æthelfrith and his wife Acca just as the first Roman missionaries were landing in Kent. Perhaps as a pagan reaction to the new threat of Christianity coming from within Anglo-Saxon society (it had always been there from British society), there was a revival of pagan inspired names containing the Os- prefix, meaning God. The name Oswald means “ruler of the gods” (Os = god, wald= ruler). It was a reference to the Germanic god Woden/Odin. Five of Æthelfrith’s seven sons were given names containing the Os- element, even though there is little precedent in either family for Os- related names. To people of Oswald’s era, the allusion to Woden in his name would have been obvious. I should point out there that Oswald’s sainthood may have something to do with his name surviving among Christians to this day, as few of the other Os- related names have survived (Oswood/Oswudu, Oswiu, Oswine/Oswin, Oslac, Oslaf, Osred, Osric were all once popular Anglo-Saxon names). Part of Woden/Odin’s iconography were two ravens named thought and memory who sat on his shoulders and acted as his spies. Other attributes of Odin are a magic spear that never misses, an 8-legged horse, a magic ring, and a pair of wolves. Part of Odin’s story in the Prose Edda is that he sacrifices one of his eyes to drink from the spring of wisdom. According to some legends, Odin hung from the world tree Yggdrasil, an ash tree, for 9 days pierced by his own spear to gain wisdom. (Spears were also made out of ash wood.) Sacrifices to Odin were hung from trees, often after being stuck with spears (or perhaps impaled on spears?). Ravens were considered messengers of the Gods. One raven does appear in Bede’s Ecclesiastical History of the English when Paulinus is trying to preach in Yorkshire. 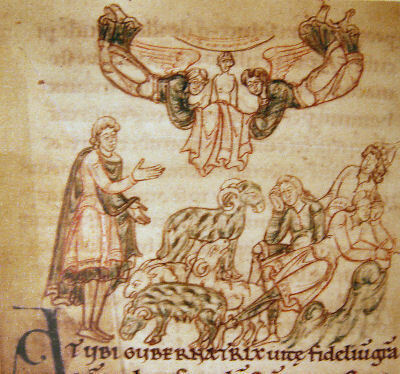 The croaking of a raven appears to be competing with Paulinus and the people think that the Gods are arguing with Paulinus. 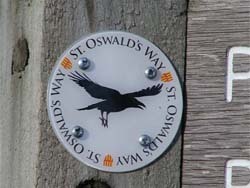 This is all relevant for Oswald’s iconography in particular his associations with ravens and rings, and the reputed site of his death at Oswestry (Oswald’s Tree). In the only historical account of Oswald’s death in Bede’s Ecclesiastical History of the English People, Oswald is slain in battle at a place called Maserfelth. After his death, King Penda of Mercia had his head and arm(s) removed and impaled on a stake. The rest of his body was buried nearby. The head and arms remained on the stake until they were recovered by Oswald’s brother Oswiu the following year and his remainder of his body was recovered by his niece Mercian Queen Osthryth at least twenty years later and enshrined at Bardney. The head was buried at Lindisfarne and eventually was collected into St Cuthbert’s coffin when Lindisfarne was abandoned due to frequent Viking raids. The arm was kept in a silver shrine in the chapel in Bamburgh castle for as long as a king ruled from Bamburgh. It was removed in twelfth century by Judith wife of Earl Tostig. This is the historical account and there are no ravens mentioned. Of course there would have been ravens around because they are attracted to battlefields and to exposed human remains. Different stories of St Oswald and the raven appear about simultaneously in England and Germany in the twelfth century. The English stories focus on the site of his death at Oswestry in Shropshire. The primary source is Regnald of Durham’s Life of Oswald from 1165. Unfortunately this life has never been translated because it is considered poor literature/hagiography. “Reginald describes in some detail the location of Oswestry, which he always refers to as ‘Maserfeld’, and mentions the ‘white church’, dedicated to Oswald, which stood there. Nearby were to be found Oswald’s well or spring and a huge ash tree, also named after the saint. There were located close to where the king’s head and arms remained fixed to stakes for a year after his death, and wood from these stakes was still preserved locally. Reginald goes on to describe the vision in which Oswald’s brother, Oswiu, was commanded to retrieve the relics. The right arm, however, had been carried off by a great bird to an ancient ash tree. The arm, which enjoyed the gift of incorruption thanks to Aidan’s prophecy, conferred on the tree a renewed freshness and vigour, which it never subsequently lost. The bird lets its booty fall, however, and where it struck the ground, the spring burst forth. Oswiu carried the relics away with him, but the tree and spring still demonstrated the saint’s miraculous powers even in Reginald’s time. No one damaged the tree with impunity, while the sick received healing from its shade or by touching or even tasting its leaves. Water from the spring similarly had healing properties, releasing the possessed from their affliction and curing all manner of ailments.” (Tudor, p. 190-1). The similarity between this story and Odin’s story in the Prose Edda is striking. 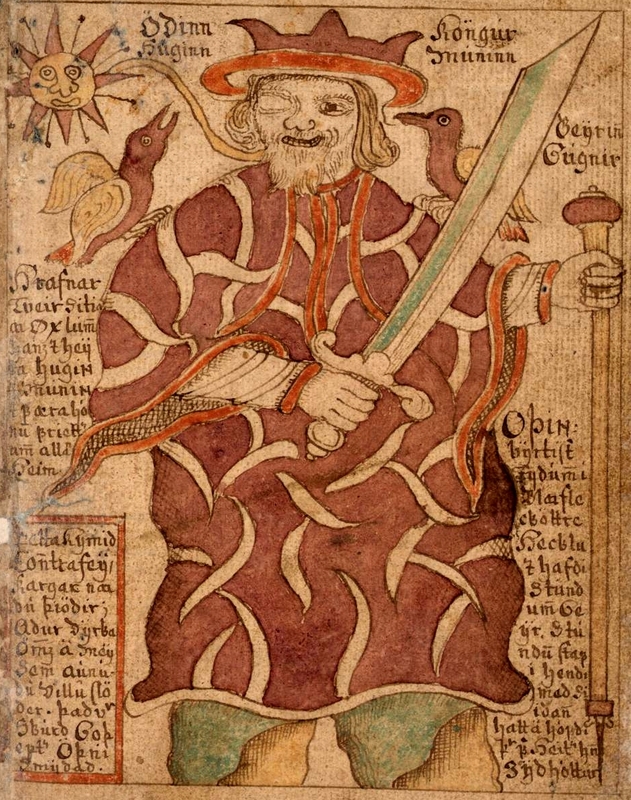 Oswald’s right arm is taken to an ash tree by a raven, Odin’s bird, who drops it and starts a holy well; Odin hung from the tree to drink from the sacred well at its base to gain wisdom. This similarity must be credited to English belief, as the Norse never controlled the area of Oswestry. 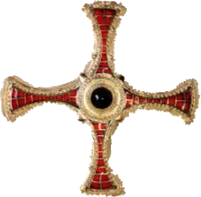 While the Welsh name for the place clearly refers to a holy cross that was erected near the church that grew up there, it is still questionable if Oswestry refers to this cross, a tree, or the tree from the raven legend. It is likely that there was a holy well located there in Saxon times. We should recall that some of the earliest miracles credited to the site of Oswald’s death were by Mercians and even a passing Briton, and that the Mercians were not converted to Christianity until at least 655-6, over a dozen years after Oswald’s death. So there was probably a full generation of those who were in the area when and where Oswald died, and the early miracles occurred for whom Germanic paganism was at least an equal contender with Christianity, if not the default belief system. Its not hard to see how the legend would have blended belief systems. Tudor mentions that 400 years after Reginald, Leland described much the same story including an ‘eagle’ that carried away the arm. Near contemporary support for Reginald’s reference to Oswald’s shrine at Oswestry comes from Gerald of Wales also refers to the church present at Oswald’s Cross (CroesOswalt) in his books on Wales in 1191-1194. How we get from Reginald to the ‘raven and the ring’ German bridal quest legends is another matter entirely and the way is obscure. Virginia Tudor (1995) Reginald’s Life of Oswald. pp. 178-194, Oswald: Northumbrian King to European Saint. Paul Watkins. I’m a great admirer of your Heavenfield blog and have learned much from it over the years. It gets a name-check in my new biography of our mutual hero Oswald. The King in the North is published by Head of Zeus and comes out in August 2013. If you happen to be this side of the Atlantic this summer, do come to the book launch at Bede’s World in Jarrow on August 8th. I’ll be interested to hear what you think of my take on Oswald. You may also be interested to know that my colleague Colm O’Brien and I convene the Bernician Studies Group at the North-east centre for Lifelong Learning in Newcastle. If you’d like to be on our mailing list for odd items of interest on all matters Northumbrian and Dark Age, let me know.